The nine members of the Square Kilometre Array (SKA) African partner countries and African Very Long Baseline Interferometry Network (AVN) projects are set to meet in Cape Town next week to coordinate their research efforts. The annual meeting will bring together science and technology ministers and senior officials from South Africa, Kenya, Madagascar, Zambia, Ghana, Botswana, Namibia, Mozambique and Mauritius for the 5th SKA/AVN African Ministerial Forum meeting, which will run from 14 to 17 October. “The main aim of the SKA/AVN African Ministerial Forum is to provide political and strategic leadership on matters pertaining to the SKA and AVN projects and other relevant radio astronomy initiatives,” the Department of Science and Technology said. This year’s meeting takes place under the theme ‘Five years of partnership through the annual SKA/AVN African Ministerial Forum meeting – a time to celebrate, reflect and ponder the future’. Last year’s meeting took place in Accra, Ghana, and coincided with the launch of the Kutunse Radio Telescope at the Ghana Radio Astronomy Observatory by the President of Ghana. Ghana was the first SKA/AVN African partner country to complete the conversion of a redundant communications antenna into a functioning radio telescope. Since its launch, the 32‑metre antenna has successfully demonstrated that it can operate as a single dish radio telescope and as part of the global very long baseline interferometry network. The Ghanaian Ministry of Environment, Science, Technology and Innovation collaborated with the South African Radio Astronomy Observatory to make the Kutunse Radio Telescope a reality. The discussion at this year’s SKA/AVN African Ministerial Forum will focus on advances in respect of the SKA, AVN and other radio astronomy programmes, as the combined effort to grow astronomy on the continent gain momentum. The AVN is a network of VLBI-capable radio telescopes on the African continent that will strengthen the science that the international VLBI community can do. It will help to develop the skills, regulations and institutional capacity needed in SKA partner countries to optimise African participation in the SKA, and enable participation in SKA pathfinder technology development and science. 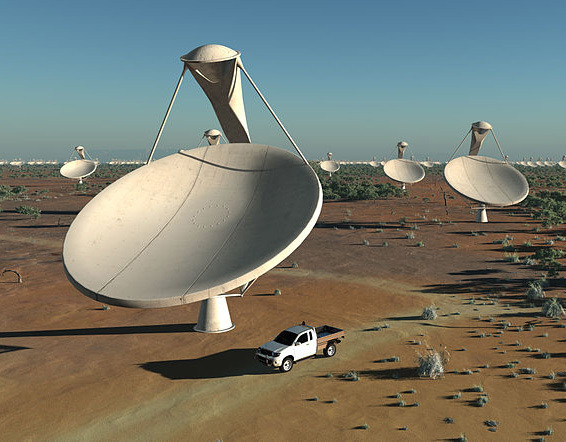 Once completed, the SKA will be the world’s biggest radio telescope. Thousands of antennas, spread over a 3 000 km, will work together as one gigantic, virtual instrument – creating a radio telescope at least 50 times more powerful and 10 000 times faster than any other radio telescope currently in existence. The SKA will also discover new aspects of the universe that have not yet been predicted and will generate more questions that need to be answered. The project will drive technology development in antennas, fibre networks, signal processing, software and computing. Spin-off innovations in these areas will benefit other systems that process large volumes of data. The design, construction and operation of the SKA has a positive impact on skills development in all partner countries. This presents many career opportunities for the youth in South Africa to get involved in the fields of maths, science, technology and other allied fields.